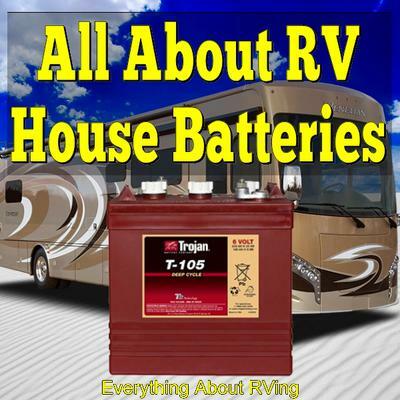 What Kind Of House Batteries Do I Need On My RV To Power The RV's Inverter? We have a Collins fifth wheel. 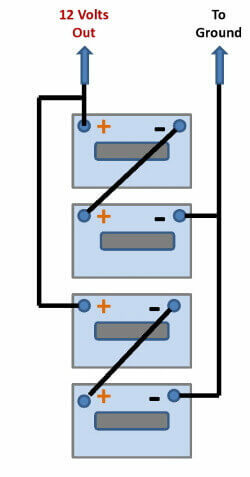 The inverter is a Heart interface, model # 20D. What batteries do we need to hook it up. The trailer came without batteries for the inverter. It's set for two batteries. Do I put in two 12 volts or two 6 volts? ANSWER: Hi Charles the answer to your question is yes, you can either use 2 6 volt batteries or 2 12 volt batteries, but the devil is in the details. The setup I would recommend for you to use would be 2 6 Volt Deep Cycle Batteries like the Trojan T105 Battery pictured at the top of this page wired in series. 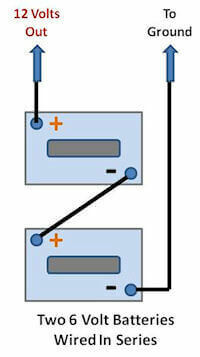 You could also use 2 12 Volt Deep Cycle Marine Type Batteries wired in Parallel. But again, I believe that the two 6 Volt True Deep Cycle Batteries are a better option. Take a look at the battery type descriptions below to find out why I recommend using 6 volt True Deep Cycle Batteries . often; the lifespan of this battery will be greatly reduced if it is used to power the 12-volt system of a 5th Wheel or frequently used by an inverter. It will also not provide power for as long as a Deep Cycle Battery. RV/Marine "Deep Cycle" Battery: This is a cross between a Cranking and true Deep Cycle Battery. It can provide enough short burst energy to start an engine and it can provide power to the house portion of the RV for longer periods of time than a Cranking Battery but not as long as a true Deep Cycle Battery. It can also be discharged and recharged more often than a Cranking Battery but will not last as long as a true Deep Cycle Battery. Again I would not recommend this battery to power your 5th Wheel's inverter. True Deep Cycle Batteries: These batteries are designed to provide a small amount of power for a longer period of time. They are definitely not designed to crank over an engine. They can be charged and discharged more often and last longer than either Cranking or RV/Marine Batteries when it comes to powering the 12-volt accessories in an RV or an inverter.